Transfer News – 30th August, 2015 Manchester United target Neymar to stay at Barcelona, Julian Draxler set to sign for Wolfsburg, Arsenal closing on Edinson Cavani deal. Manchester United target Neymar to stay at Barcelona, Julian Draxler set to sign for Wolfsburg, Arsenal closing on Edinson Cavani deal and much more in today’s transfer gossips. The Brazilian star has been linked to English giants Manchester United, according to SkySports. Arsenal are reportedly closing on to sign Paris Saint Germain striker Edinson Cavani for a fee around £40million. The Gunners are yet to sign a striker in this window and the reports believe that Arsene Wenger will be planning to sign on the deadline day. West Brom have completed the signing of center-back Jonny Evans from Manchester United on a long term contract. The 27-year-old left the Old Trafford side after making 198 appearances in all campaigns. Turkish side Fenerbahce have completed the signing of Lazar Markovic from Liverpool on a one year loan deal. The 21-year-old who joined the Reds last summer will be spending this season in Turkey. 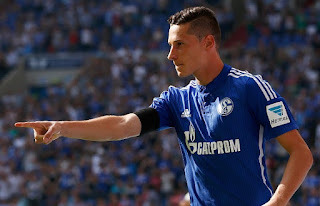 Julian Draxler is set to complete his move to Wolfsburg, according to ESPN. Wolfsburg who have sold their star attacker Kevin De Bruyne to Manchester City recently will be signing Draxler as his replacement.